Here’s an unusual thing for you to read: I am posting a brief description of a grant proposal that I will submit for the ‘vici’-competition of the Netherlands Organization for Scientific Research 2019 later this year. You can download the “pre-proposal” here. It is called “Global Giving”. With the study I aim to describe and explain philanthropy in a large number of countries across the world. I invite you to review the “pre-proposal” and suggest improvements; please use the comments box below, or write to me directly. You may have heard the story that university researchers these days spend a lot of their time writing grant proposals for funding competitions. Also you may have heard the story that chances of success in such competitions are getting smaller and smaller. These stories are all true. But the story you seldom hear is how such competitions actually work: they are a source of stress, frustration, burnouts and depression, and a complete waste of the precious time of the smartest people in the world. Recently, Gross and Bergstrom found that “the effort researchers waste in writing proposals may be comparable to the total scientific value of the research that the funding supports”. Remember the last time you saw the announcement of prize winners in a research grant competition? I have not heard a single voice in the choir of the many near-winners speak up: “Hey, I did not get a grant!” It is almost as if everybody wins all the time. It is not common in academia to be open about failures to win. How many vitaes you have seen recently contain a list of failures? This is a grave distortion of reality. Less than one in ten applications is succesful. This means that for each winning proposal there are at least nine proposals that did not get funding. I want you to know how much time is wasted by this procedure. So here I will be sharing my experiences with the upcoming ‘vici’-competition. First let me tell you about the funny name of the competition. The name ‘vici’ derives from roman emperor Caesar’s famous phrase in Latin: ‘veni, vidi, vici’, which he allegedly used to describe a swift victory. The translation is: “I came, I saw, I conquered”. The Netherlands Organization for Scientific Research (‘Nederlandse organisatie voor Wetenschappelijk Onderzoek’, NWO) thought it fitting to use these names as titles of their personal grant schemes. The so-called ‘talent schemes’ are very much about the personal qualities of the applicant. The scheme heralds heroes. The fascination with talent goes against the very nature of science, where the value of an idea, method or result is not measured by the personality of the author, but by its validity and reliability. That is why peer review is often double blind and evaluators do not know who wrote the research report or proposal. Yet in the talent scheme, the personality of the applicant is very important. The fascination with talent creates Matthew effects, first described in 1968 by Robert K. Merton. The name ‘Matthew effect’ derives from the biblical phrase “For to him who has will more be given” (Mark 4:25). Simply stated: success breeds success. Recently, this effect has been documented in the talent scheme by Thijs Bol, Matthijs de Vaan and Arnout van de Rijt. When two applicants are equally good but one – by mere chance – receives a grant and the other does not, the ‘winner’ is ascribed with talent and the ‘loser’ is not. The ‘winner’ then gets a tremendously higher chance of receiving future grants. As a member of committees for the ‘veni’ competition I have seen how this works in practice. Applicants received scores for the quality of their proposal from expert reviewers before we interviewed them. When we had minimal differences between the expert reviewer scores of candidates – differing only in the second decimal – personal characteristics of the researchers such as their self-confidence and manner of speaking during the interview often made the difference between ‘winners’ and ‘losers’. Ultimately, such minute differences add up to dramatically higher chances to be a full professor 10 years later, as the analysis in Figure 4 of the Bol, De Vaan & Van de Rijt paper shows. My career is in this graph. In 2005, I won a ‘veni’-grant, the early career grant that the Figure above is about. The grant gave me a lot of freedom for research and I enjoyed it tremendously. I am pretty certain that the freedom that the grant gave me paved the way for the full professorship that I was recently awarded, thirteen years later. But back then, the size of the grant did not feel right. I felt sorry for those who did not make it. I knew I was privileged, and the research money I obtained was more than I needed. It would be much better to reduce the size of grants, so that a larger number of researchers can be funded. Yet the scheme is there, and it is a rare opportunity for researchers in the Netherlands to get funding for their own ideas. This is my third and final application for a vici-grant. The rules for submission of proposals in this competition limit the number of attempts to three. Why am I going public with this final attempt? You will have heard about open science. Most likely you will associate it with the struggle to publish research articles without paywalls, the exploitation of government funded scientists by commercial publishers, and perhaps even with Plan S. You may also associate open science with the struggle to get researchers to publish the data and the code they used to get to their results. Perhaps you have heard about open peer review of research publications. But most likely you will not have heard about open grant review. This is because it rarely happens. I am not the first to publish my proposal; the Open Grants repository currently contains 160 grant proposals. These proposals were shared after the competitions had run. The RIO Journal published 52 grant proposals. This is only a fraction of all grant proposals being created, submitted and reviewed. The many advantages of open science are not limited to funded research, they also apply to research ideas and proposals. By publishing my grant proposal before the competition, the expert reviews, the recommendations of the committee, my responses and experiences with the review process, I am opening up the procedure of grant review as much as possible. check back in a few weeks. Your comments and suggestions on the ideas above and the pre-proposal are most welcome! Economen spreken van een basisgoed als de consumptie ervan relatief gesproken afneemt met het inkomen. Dit geldt heel duidelijk voor geven aan goede doelen. Hogere inkomens en vermogens doen in euro’s meer aan filantropie, maar als deel van hun inkomen en vermogen juist minder. In de jubileumeditie van Geven in Nederland (GIN) publiceerden Arjen de Wit, Pamala Wiepking en ik een special, waarin waarin we alle gegevens over giften uit de jaren 2001-2015 hebben gecombineerd en de inkomens in decielen (groepen van 10%) hebben ingedeeld. De invloed van uitschieters hebben we verminderd door de 1% hoogste waarnemingen te winsoriseren, dat wil zeggen ze te behandelen alsof ze net iets lager zijn. Met uitschieters is het plaatje overigens niet veel anders, de lijn loopt nog steeds naar beneden, maar minder recht. Het percentage van het inkomen dat huishoudens doneren aan goededoelenorganisaties neemt stelselmatig af met de hoogte van het inkomen. De 10% huishoudens die de laagste inkomens in Nederland verdienen, geven 1,16% van het inkomen aan goede doelen. Onder de hoogste 10% van de inkomens is dat 0,44%. Vivienne van Leuken vroeg me per e-mail hoe dit komt. Er zijn grofweg drie groepen verklaringen voor deze bevinding. (b) hebberige mensen worden rijker. (c) goededoelenorganisaties doen niet de juiste proposities. (c) De vrijgevigheidsnorm dat je een deel van je inkomen zou moeten geven is in de loop van de geschiedenis verdwenen. Bovendien houdt met de ontkerkelijking een steeds kleiner deel van de bevolking zich aan zulke normen. In elk van deze verklaringen zit wel een kern van waarheid, maar er is nog geen goed onderzoek dat aantoont in welke mate deze drie soorten verklaringen verantwoordelijk zijn voor de afname van de vrijgevigheid met inkomen en vermogen. At the Center for Philanthropic Studies we have been working hard to secure funding for three rounds of funding for the Giving in the Netherlands Study, including the Giving in the Netherlands Panel Survey for the years 2020-2026. During the previous round of the research, the ministry of Justice and Security has said that it would no longer fund the study on its own, because the research is important not only for the government but also for the philanthropic sector. The national government no longer sees itself as the sole funder of the research. The Giving in the Netherlands study contributes to the visibility of philanthropy in the Netherlands. This is important for the legitimacy of an autonomous and growing sector. It is important to engage in a conversation with relevant stakeholders before the fieldwork for a next round starts, in order to align the research more strongly with practice. After the analyses have been completed, communication with relevant stakeholders about the results should be improved. Stakeholders desire more conversations about the application of insights from the research in practice. The center includes these issues in the plans for the upcoming three editions. VU Amsterdam has been engaged in conversations with branch organizations and individual foundations in the philanthropic sector for a long time, in order to build a sustainable financial model for the future of the research. However, at the moment we do not have the funds together to continue the research. That is why we did not collect data for the 2018 wave of the Giving in the Netherlands Panel Survey. As a result, we will not publish estimates for the size and composition of philanthropy in the Netherlands in spring 2019. We do hope that after this gap year we can restart the research next year, with a publication of new estimates in 2020. Your ideas and support are very welcome at r.bekkers@vu.nl. Het Centrum voor Filantropische Studies werkt momenteel met man en macht om de financiering voor het onderzoek Geven in Nederland voor de komende 6 jaar (3 edities) veilig te stellen. Het Ministerie van Justitie en Veiligheid (J&V) heeft bij de opzet van Geven in Nederland 2017 medio 2015 te kennen gegeven dat het onderzoek niet langer alleen door de overheid zal worden gefinancierd, met als belangrijkste argumentatie dat het onderzoek van belang is voor overheid én sector filantropie. De overheid ziet zichzelf niet langer als enige verantwoordelijke voor de financiering van het onderzoek. Het Ministerie van J&V wil zich wel voor een langere tijd structureel verbinden aan Geven in Nederland en geeft 1:1 matching voor financiële bijdragen die de VU vanuit de sector ontvangt. Om de maatschappelijke relevantie van – en commitment voor – het onderzoek Geven in Nederland te versterken heeft de VU de afgelopen maanden de dialoog opgezocht met diverse relevante doelgroepen. Doel: wetenschap en praktijk dichter bij elkaar brengen. ‘Geven in Nederland’ draagt bij aan de zichtbaarheid van maatschappelijk initiatief in Nederland. Belangrijk ter legitimatie van een zelfstandige en snel groeiende sector. Communicatie met relevante doelgroepen vóór de start van het onderzoek dient verbeterd te worden met als doel om inhoudelijk beter aansluiting te vinden bij praktijk en beleid. Communicatie over onderzoeksresultaten naar relevante doelgroepen dient verbeterd te worden. Het gaat dan om de praktische toepasbaarheid van het onderzoek, de vertaling van de onderzoeksresultaten naar de praktijk. De onderzoekers nemen deze verbeterpunten mee in hun plan van aanpak voor de komende drie edities. De VU is al enige tijd in gesprek met de brancheorganisaties en individuele fondsen om tot een duurzaam financieringsmodel voor de toekomst te komen. Op dit moment is de continuering van het onderzoek echter nog niet gegarandeerd. Dat betekent dat er helaas geen Geven in Nederland 2019 komt en dus ook geen presentatie van de nieuwe onderzoeksresultaten zoals u van ons gewend bent op de Dag van de Filantropie. We spreken echter onze hoop uit dat we zeer binnenkort met een Geven in Nederland 2020 kunnen starten! In the prehistoric era of competitive science, researchers were like magicians: they earned a reputation for tricks that nobody could repeat and shared their secrets only with trusted disciples. In the new age of open science, researchers share by default, not only with peer reviewers and fellow researchers, but with the public at large. The transparency of open science reduces the temptation of private profit maximization and the collective inefficiency in information asymmetries inherent in competitive markets. In a seminar organized by the University Library at Vrije Universiteit Amsterdam on November 1, 2018, I discussed recent developments in open science and its implications for research careers and progress in knowledge discovery. The slides are posted here. The podcast is here. Gordon Feld posted a comparison of results from a repeated measures ANOVA with paired samples t-tests. 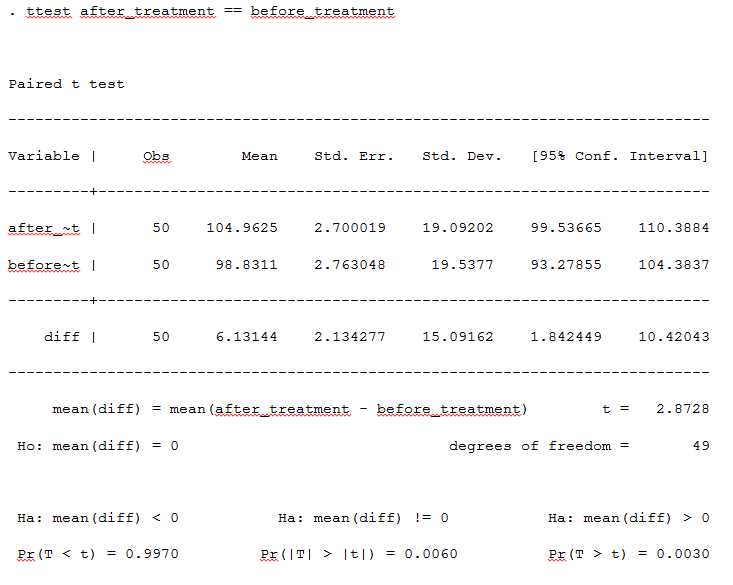 Using Stata, I wondered how these results would look in a regression framework. For those of you who want to replicate this: I used the data provided by Gordon. The do-file is here. Because wordpress does not accept .do files you will have to rename the file from .docx to .do to make it work. The Stata commands are below, all in block quotes. The output is given in images. In the explanatory notes, commands are italicized, and variables are underlined. A pdf of this post is here. First let’s examine the data. You will have to insert your local path at which you have stored the data. There are some differences in mean values, from 98.8 before treatment to 105.0 after treatment. 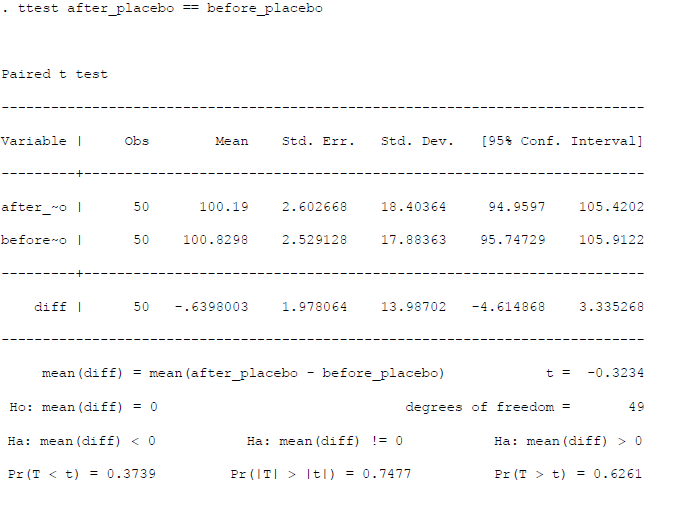 Mean values for the placebo measures are 100.8 before and 100.2 after. Across all measures, the average is 101.2035. Let’s replicate the t-test for the treatment effect. 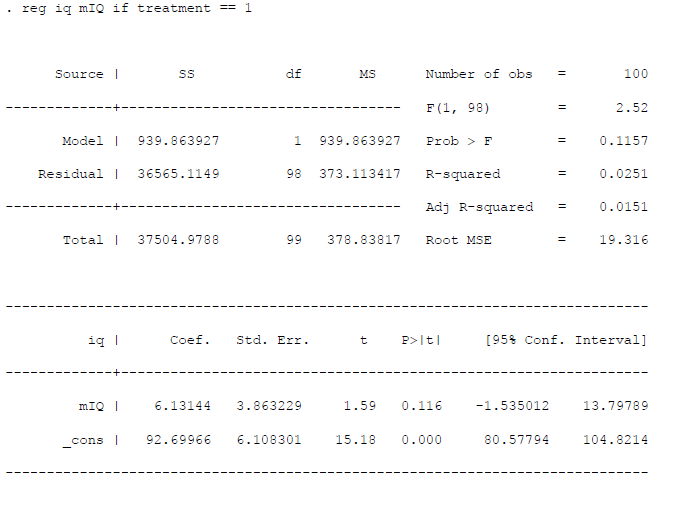 The increase in IQ after the treatment is 6.13144 (SE = 2.134277), which is significant in this one-sample paired t-test (p = .006). Now let’s do the t-test for the placebo conditions. The decrease in IQ after the placebo is -.6398003 (SE = 1.978064), which is not significant (p = .7477). The question is whether we have taken sufficient account of the nesting of the data. We have four measures per participant: one before the treatment, one after, one before the placebo, and one after. In other words, we have 50 participants and 200 measures. To get the data into the nested structure, we have to reshape them. 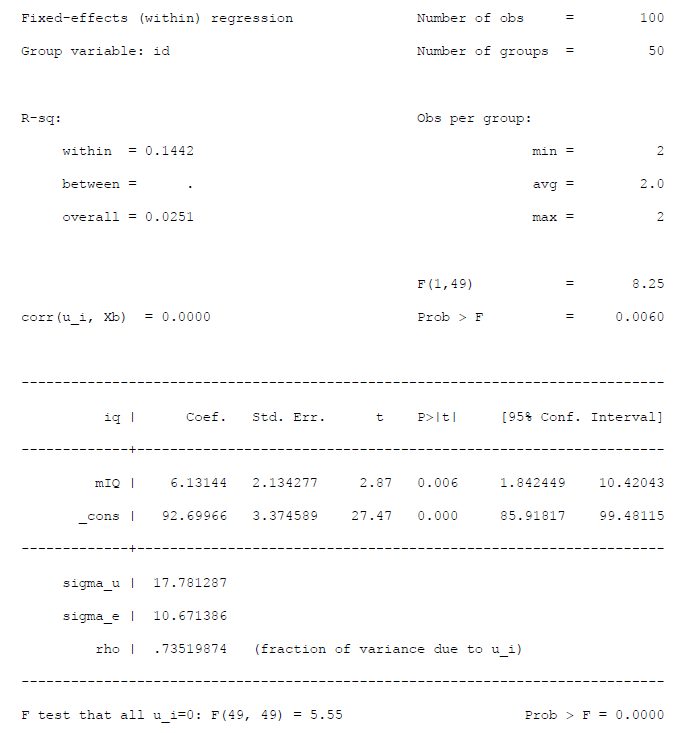 The data are now in a wide format: one row per participant, IQ measures in different columns. But we want a long format: 4 rows per participant, IQ in just one column. To get this done we first assign a number to each participant. We now have a variable id with a unique number for each of the 50 participants. 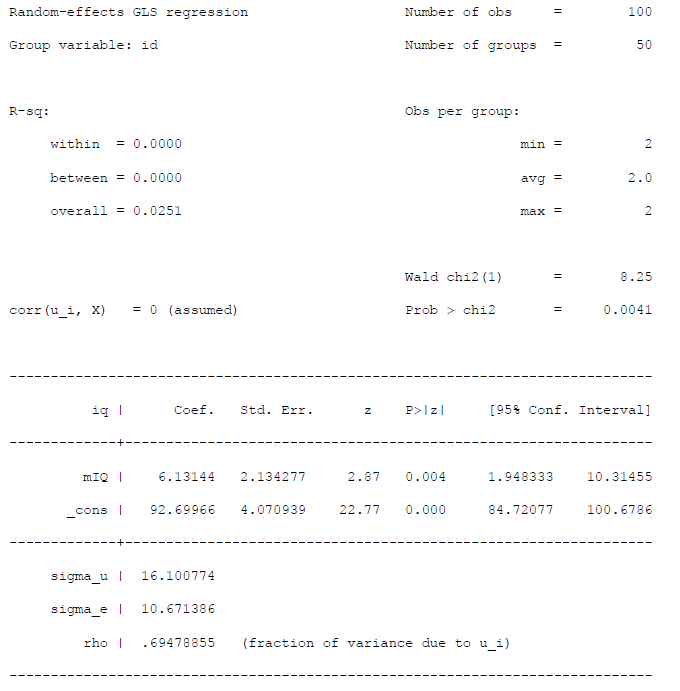 The Stata command for reshaping data requires the data to be set up in such a way that variables measuring the same construct have the same name. We have 4 measures of IQ, so the new variables will be called iq1, iq2, iq3 and iq4.
. rename (before_treatment after_treatment before_placebo after_placebo) (iq1 iq2 iq3 iq4). Now we can reshape the data. The command below assigns a new variable ‘mIQ’ to identify the 4 consecutive measures of IQ. We now have 200 lines of data, each one is an observation of IQ, numbered 1 to 4 on the new variable mIQ for each participant. The variable mIQ indicates the order of the IQ measurements. Now we identify the structure of the two experiments. The first two measures in the data are for the treatment pre- and post-measures. Observations 3 and 4 are for the placebo pre- and post-measures. We have 100 observations in each of the experiments. OK, we’re ready for the regressions now. Let’s first conduct an OLS to quantify the changes within participants in the treatment and placebo conditions. The regression shows that the treatment increased IQ by 6.13144 points, but with an SE of 3.863229 the change is not significant (p = .116). 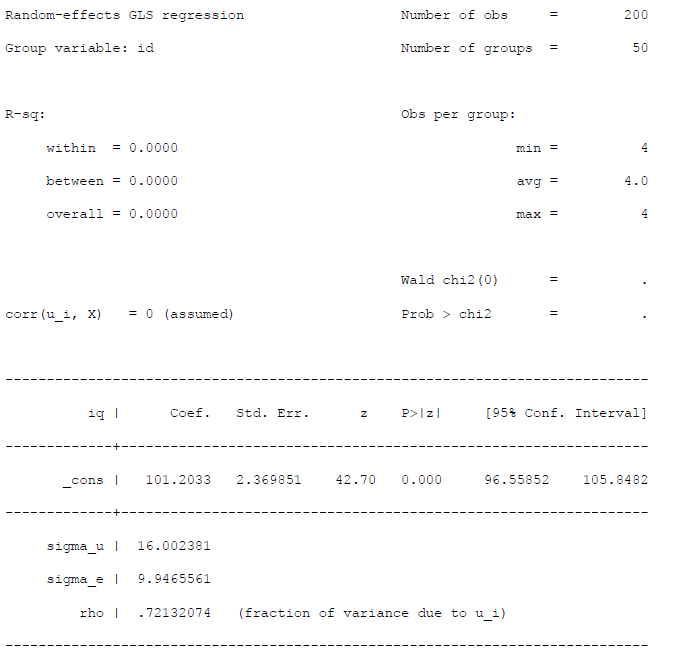 The effect estimate is correct, but the SE is too large and hence the p-value is too high as well. 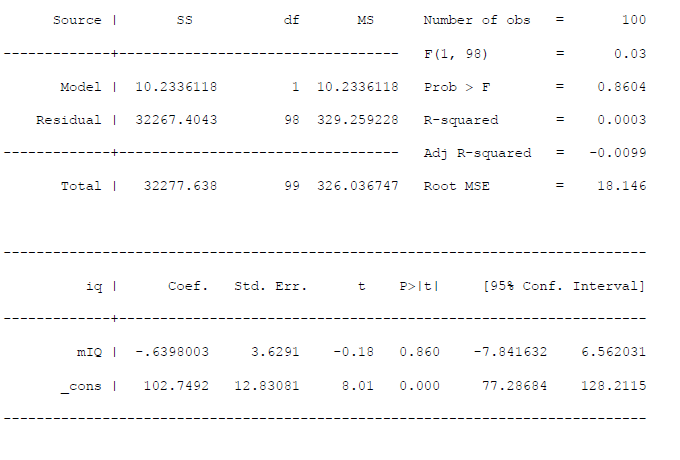 The placebo regression shows the familiar decline of .6398003, but with an SE of 3.6291, which is too high (p = .860). 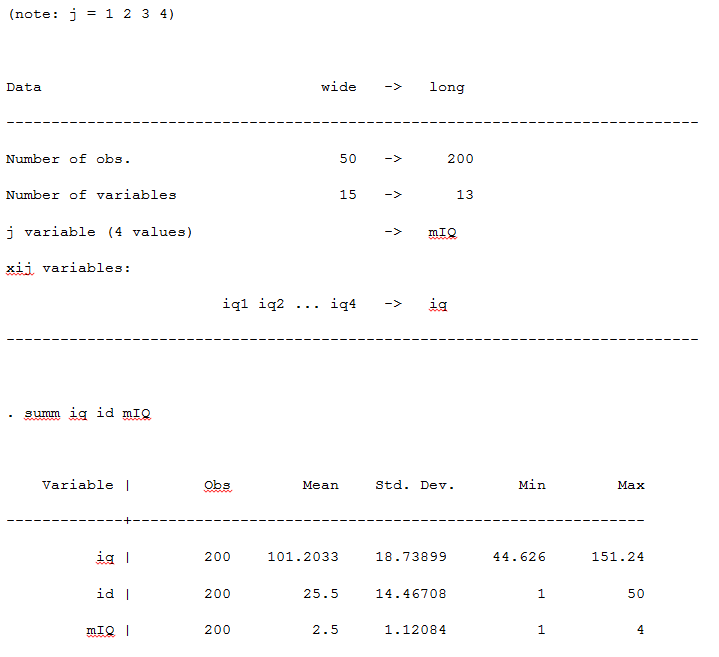 The SE and p-values are incorrect because OLS does not take the nested structure of the data into account. With the xtset command we identify the nesting of the data: measures of IQ (mIQ) are nested within participants (id). First we run an ’empty model’ – no predictors are included. Two variables in the output are worth commenting on. The constant (_cons) is the average across all measures, 101.2033. This is very close to the average we have seen before. The rho is the intraclass correlation – the average correlation of the 4 IQ measures within individuals. It is .7213, which seems right. Now let’s replicate the t-test results in a regression framework. 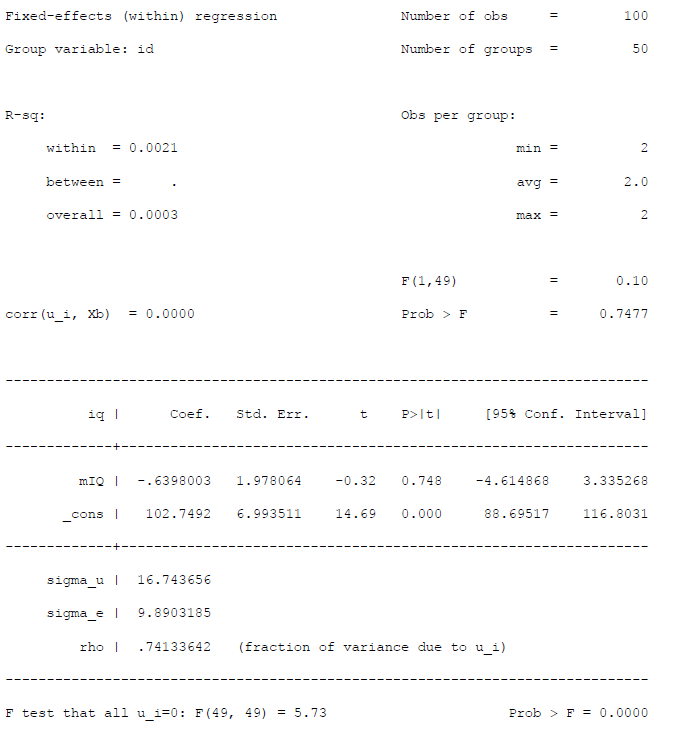 In the output below we see the 100 observations in 50 groups (individuals). We obtain the same effect estimate of the treatment as before (6.13144) and the correct SE of 2.134277, but the p-value is too small (p = .004). Let’s run the same regression for the placebo conditions. 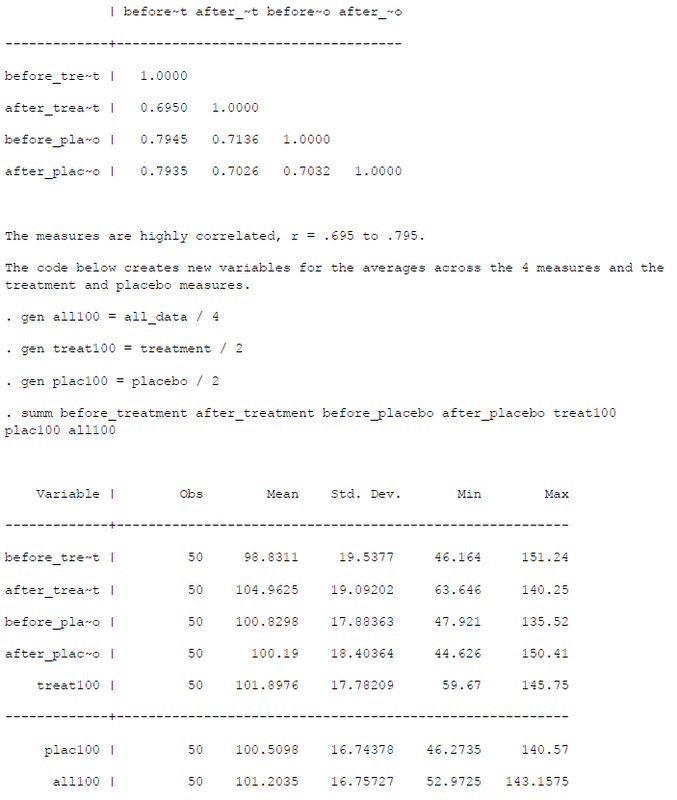 The placebo effect is the familiar -.6398003, SE = 1.978064, now with the accurate p-value of .748. Public debates on philanthropy link charitable giving to wealth. In the media we hear a lot about the giving behavior of billionaires – about the giving pledge, the charitable foundations of the wealthy, how the causes they support align their business interests, and how they relate to government programs. Yes – the billions of tech giants go a long way. Imagine a world without support from foundations created by wealthy. But we hear a lot less about the everyday philanthropy of people like you and me. The media rarely report on everyday acts of generosity. The force of philanthropy is not only in its focus and mass, but also in its breadth and popularity. It is one of the common remarks I hear when family, friends and colleagues return from holidays in ‘developing countries’ like Moldova, Myanmar or Morocco: “the people there have nothing, but they are so kind and generous!” The kindness and generosity that we witness as tourists are manifestations of prosociality, the very same spirit that is the ultimate foundation of everyday philanthropy. And also within our own nations, we find that most people give to charity. Why are people in Europe so strongly engaged in philanthropy? In Europe we are much more likely to think that most people can be trusted than in other parts of the world. It is this faith in humanity that is crucial for philanthropy. We can see this in a comparison of countries within Europe. The figure combines data from the World Giving Index reports of CAF from 2010-2017 on the proportion of the population giving to charity with data from the Global Trust Research Consortium on generalized social trust. The figure shows that citizens of more trusting countries in Europe are much more likely to give to charities (you can get the data here, and the code is here). The correlation is .52, which is strong. One of the reasons why citizens in more trusting countries are more likely to give to charity is that trust is lower in more unequal countries. Combining the data on trust with data from the OECD on income inequality (GINI) reveals a substantial negative correlation of -.37. The larger the differences in income and wealth in a country become, the lower the level of trust that people have in each other. As the wealth of the rich increases, the poor get increasingly envious, and the rich feel an increasing urge to protect their wealth. In such a context, conspiracy theories thrive and institutions that should be impartial and fair to all are trusted less. The criticism that wealthy donors face also stems from this foundation: those concerned with equality and fairness fear the elite power of philanthropy. Et voila: here is the case why it is in the best interest of foundations to reduce inequality.